This is the Imagine, a new all-electric concept car from Kia. It’s a great-looking concept with some clever and witty touches – not least of which are the 21 individual ultra-high-resolution screens that are curved cross the top of the dashboard in a really eye-catching way. The four-door passenger car will have a low-mounted, induction-charged battery pack, but other than that, details on the Imagine’s powertrain are still under wraps. 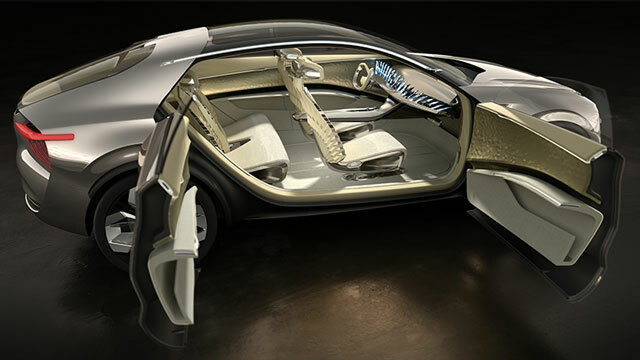 EV powertrain layouts do, however, allow for designers to have much more space to play with on the inside of the car and the Imagine creators grasped that opportunity. The fun layout of those screens aside, there’s plenty more interesting stuff going on here. There are thin ‘wingcams’ for rear view mirrors; rear-hinged doors at the back; a single sheet of glass is used for both the windscreen and roof; and the paint work consists of six hand-applied layers of chrome-effect silver paint covered in a tanned bronze tint. The Imagine sits on 22-inch alloy wheels featuring four flush inserts of transparent acrylic glass that reflect and refract light. Those wheels are fitted with Goodyear 255/35R22 Intelligrip EV concept tyres.